2. Phospholipid is a major component of cell membrane and hence is distributed all over the body of an organism. A phospholipid molecule consists of one glycerol molecule attached to two fatty acids chain and one phosphate group. Additional small molecules (usually polar) can be linked to the phosphate group to form a variety of different phospholipids. For instance, choline molecule attaches to the phosphate group of phospholipids to form lecithin. 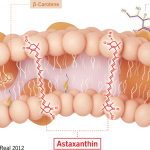 Lecithin is the most common phospholipid in human bodies. The major phospholipids of cell membrane is lecithin. The fatty acids of lecithin is oleic acid (unsaturated) and stearic acid (saturated). 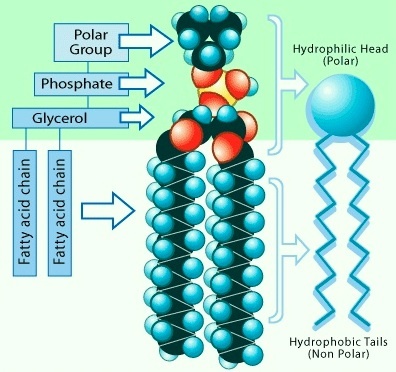 The hydrophilic head of phospholipid molecules is soluble in water, while the hydrophobic tail is insoluble in water. In water, phospholipid molecules assemble into a droplet called micelle. On the surface of water, phospholipid molecules are assemble closely with hydrophilic heads dissolved in water and the tails jutting out of the surface. 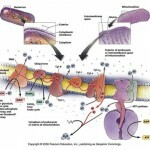 In cells, both the intracellular environment and the immediate external environment are water. This causes phospholipids to form bilayer. In this bilayer, the hydrophilic heads are on the outside (in contact with water); the tails of phospholipids point to the interior. This bilayer is the main structures in the formation of cell membrane. Phospholipids are the main structural components for cell membranes. Phospholipid such as lecithin is involved in the production of neurotransmitters such as acetylcoline in the neurons. 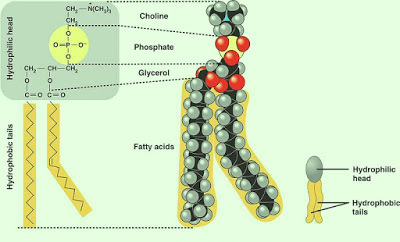 Phospholipid molecules are usually involved in transporting fat in the body. One of the chief sources of this acid in foods is olive oil. Whole olives also contain the compound, but typically only in trace amounts. When pressed and drained together, however, the olives’ acid levels are combined, leading to high concentrations in most cases. Canola and grapeseed oil also contain oleic acid.